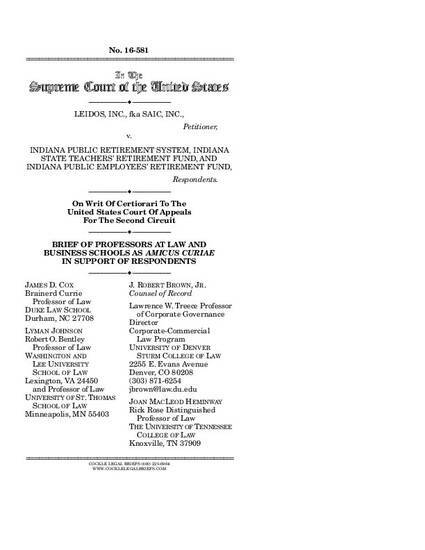 This Amicus Brief was filed with the U.S. Supreme Court on behalf of nearly 50 law and business faculty in the United States and Canada who have a common interest in ensuring a proper interpretation of the statutory securities regulation framework put in place by the U.S. Congress. Specifically, all amici agree that Item 303 of the Securities and Exchange Commission's Regulation S-K creates a duty to disclose for purposes of Rule 10b-5(b) under the Securities Exchange Act of 1934. At the same time, the failure to find a duty to disclose in these circumstances will hinder enforcement of the system of mandatory reporting applicable to public companies and weaken compliance. Reversal of the lower court would reduce incentives to comply with the requirements mandated by the system of periodic reporting. Enforcement under Section 10(b) of and Rule 10b-5(b) under the Securities Exchange Act of 1934 by investors in the case of nondisclosure will effectively be eliminated. Reversal would likewise reduce the tools available to the Securities and Exchange Commission to ensure compliance with the system of periodic reporting. In an environment of diminished enforcement, reporting companies could perceive their disclosure obligations less as a mandate than as a series of options. Required disclosure would more often become a matter of strategy, with issuers weighing the obligation to disclose against the likelihood of detection and the reduced risk of enforcement. Under this approach, investors would not make investment decisions on the basis of “true and accurate corporate reporting. . . .” They would operate under the “predictable inference” that reports included the disclosure mandated by the rules and regulations of the Securities and Exchange Commission. Particularly where officers certified the accuracy and completeness of the information provided in the reports, investors would have an explicit basis for the assumption. They would therefore believe that omitted transactions, uncertainties, and trends otherwise required to be disclosed had not occurred or did not exist. Trust in the integrity of the public disclosure system would decline. The lower court correctly recognized that the mandatory disclosure requirements contained in Item 303 gave rise to a duty to disclose and that the omission of material trends and uncertainties could mislead investors. The decision below should be affirmed.